The Pancreatitis and Liver Support Kit is an all- natural, holistic treatment that is excellent for cats and dogs who have had pancreatitis. 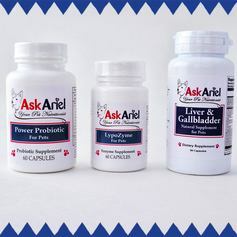 It includes three formulas: Power Probiotic, Lypozyme and Liver & Gallbladder Support Formula. The three formulas are powerful, individual formulas and can be purchased separately but for best results, we recommend using the three formulas together. The formulas are all capsules that can be opened and the powders inside can be sprinkled on food. Please include your pet's diet and diagnoses on the order form at checkout. We will include a diet suggestion on the packing slip that comes with your order.